Massive Compilation of Media Material Proving April 7, 2018 Chemical Attack in Dhouma Syria Was a False Flag Conducted By The White Helmet Terrorists – Follow link above to see large amount of MSM reports finally exposing the White Helmet terrorists for what they really are after April 7, 2018 false flag chemical weapons attack. “Now You See Me” – Over 100 White Helmet Self-Posted Facebook Images Expose Fake Humanitarian Group as FSA Terrorists Linked with Al-Qaeda – Links to large number of White Helmets Facebook accounts prove they upload images in support of al-Qaeda and ISIS to their own Facebook accounts. 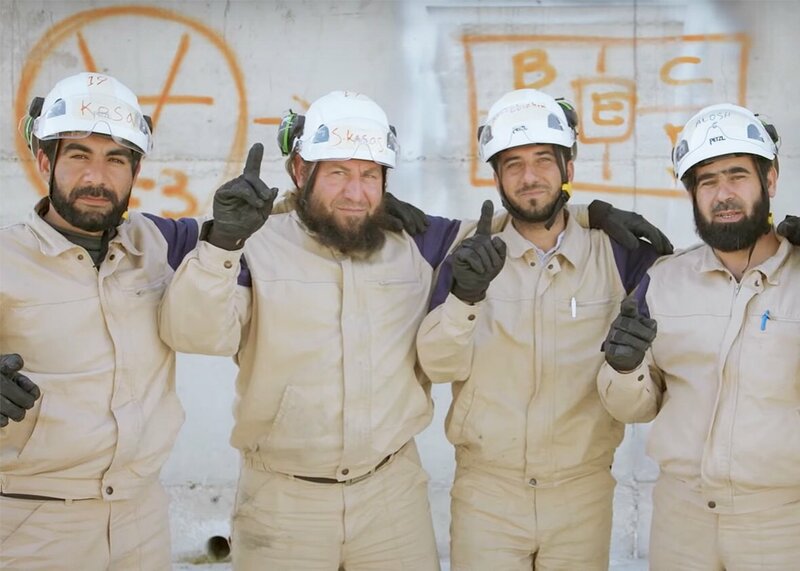 Direct Terrorist Collusion: Over One Dozen Videos Capture White Helmets Working Side-By-Side With Terrorist Groups in Syria – Link to a large number of videos proving clearly that the White Helmets work directly alongside terrorist groups in Syria. Warning: Some images below are graphic and show beheading of a child by a White Helmet terrorist. Intertwined – The White Helmets and FSA Terrorist Groups – Evidence of Collusion -Part 1 – Link to over a dozen White Helmet Facebook account links, plus links to AFP employed jihadist accounts that show support for the FSA and White Helmet terrorists. Link also highlights how EU leaders are financing and encouraging FSA infiltration into Europe. The White Helmets Terrorists – Further Extensive Evidence of Direct Collusion with Islamic Terrorist Groups – (Set 4) – Attached link features over 100 additional screen-captured Facebook images that have been cached from the Facebook accounts of over one dozen additional White Helmet accounts and will highlight the fact that the White Helmets post images to their own Facebook accounts that are in support of the FSA and various designated murderous terrorist groups, including al-Nusra Front, Ahrar al-Sham, al-Qaeda, ISIS and others. Note that Facebook allows all this terrorist activity unimpeded yet censors Americans and people in the west who exposing it. Facebook does this by labeling truth tellers as Russian trolls, hate speech inciters and Assad apologists. The White Helmets are protected and allowed a free pass by western social media giants such as Facebook, Twitter, Google, You Tube, etc. There is no censorship for them. Netflix, Hollywood, US media and publishing houses promote them and conceal their real agenda. The FSA, which is comprised of terrorist groups, also receives a free pass. ISIS and the FSA are one and the same……..
False Flagger: Al-Nusra Front Terrorist ‘Reporter’ Hadi Abdallah First Responder to Chemical Massacre in Idlib, Syria on April 4th, 2017 -Link and videos highlight the actions of Hadi Abdallah who is a well known propaganda disseminator for the White Helmets and FSA which is comprised of numerous terrorist groups operating in Syria, including al-Nusra Front, Jabrat al-Nusra and Nour al-Zinki. All of these groups are well known for conducting horrific war crimes and atrocities, including beheadings. 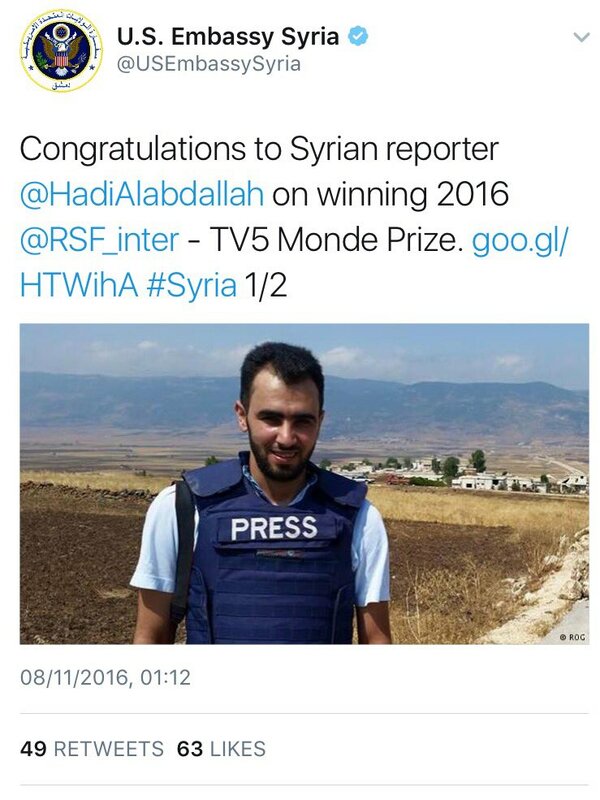 Hadi Abdallah has been filmed on multiple occasions congratulating, hugging and working alongside these murderous terrorist groups, as well as the White Helmets. Had Abdallah with Abdullah al-Muhaysini, the leader of al-Nusra Front (al-Qaeda in Syria). Abdullah al-Muhaysini, the leader of al-Nusra Front (al-Qaeda in Syria prompted by Bilal Abdul Kareem of You Tube’s uncensored On The Ground News channel (OGN). White Helmet in images above and below is Muawiya Hassan Agha who later killed the two Syrian army soldiers in the image above. They were tortured on camera then later shot. His terrorist activities are fully revealed in the following linked post. Democracy Now interviews Saving Syria’s Children “napalm” doctor Rola Hallam without divulging that her father is a prominent Syrian National Council advocate and her charity is linked to armed fighters. Hollywood’s elite in particular has played a very nefarious and intentionally deceptive role. Video Links White Helmets Who Received Oscar Directly to FSA Terror Groups White Helmets caught sharing the same headquarters with the FSA who are made up of terror groups. George Clooney’s buddies side by side with terrorists. 2nd video of same meeting above has now been removed from You Tube. White Helmets Meeting Directly Links Fake Aid Organization to FSA Terrorist Groups The White Helmets claim to be a non-partisan humanitarian aid group that works towards rescuing all Syrian civilians in trouble spots, however, they are no where to be found in Syrian government controlled areas and are instead only operating in terrorist held areas. This video clearly shows why. They are directly operating as an arm of the Free Syrian Army which is affiliated with dozens of designated terrorist groups throughout Syria. MSM Misinformation: Comparing the Wikipedia Page of the White Helmet Terrorists with the Actual Images From Their Own Facebook Accounts – Link to post providing screenshots of the current Wikipedia page of the White Helmets and juxtapose those screenshots with images and links taken from the White Helmets own Facebook accounts. The purpose of this post is to highlight the hypocrisy of mainstream media outlets that have covered for the White Helmets, as well as to expose the manner in which Wikipedia is utilized to disseminate misinformation to the public. This post also serves to expose the fake ‘fact-checking’ organization Snopes as a misinformation conduit. 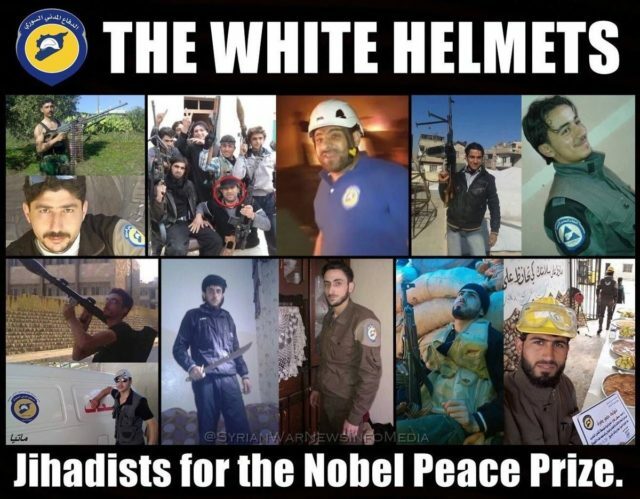 Video – James Corbett of The Corbett Report reveals the murderous truth about the White Helmet terrorists. 21st Century Wire and Vanessa Beeley reveal the truth about the White helmets deception at the following links. Link to above video showing White Helmets training wearing FSA flag. Caveat: All information above, and my opinion derived from such, was acquired through postings conducted online by the individuals mentioned within the material and other researchers. I leave it up to diligent citizens to judge for themselves the validity of the aforementioned material and my opinions related to such, as is their right. This information is posted as a public service. Sometimes true patriotism requires dissent and revealing that which the powers that be would prefer remain hidden in the shadows. I subscribe to the philosophy of USMC General Smedley Butler and believe war is a racket, a rich man’s trick. I am a Marine Corps vet (1st Battalion, 6th Marines, 2nd Mar Div) who loves humanity and hopes to help save lives of innocent people as well as my brothers and sisters in the Armed Forces who may be used during this time of wars of deception and false flags (as shown above). I believe my posts at my Steemit and Clarity of Signal WordPress site are very important for humanity right now and recommend people get properly red pilled and research these issues thoroughly themselves. I reserve my right to free speech and my opinion based on all the above information which is easily accessible online (now just imagine if the mainstream media bothered to do what I have done here when it comes to real reporting and research). Instead they have done the opposite and covered it up. Wake up folks. The enemy is not foreign…..it is domestic. It is those who would lie to you and sell you murder, war and deception. It is those who enrich themselves through this horror.